Situated at 3450 m above the Romanche valley, The Refuge de l'Aigle (Eagle refuge) is attached to the Eagle Rock, in one of the most extraordinary sites in Oisans, near the North face of La Meije mountain. 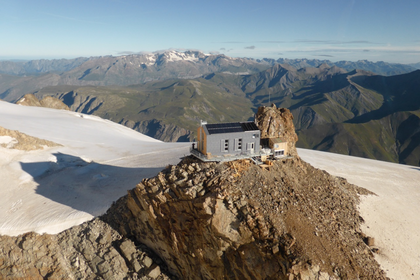 At the heart of the Ecrins National Park, in the municipality of La Grave, at 3450m altitude, "the Eagle Mountain Hut" is owned for over a century club of legendary shelters. The Eagle is one of the oldest mountain hut built by the French Federation of Alpine Clubs and Mountain (FFCAM) and managed by the French Alpine Club of Briançon. It holds a unique place in the history of French mountaineering and reminds to insiders and passionate climbers, that Pierre Gaspard, achieve the summit of La Meije and its edges in 1877. A night at the Eagle is synonymous with a powerful and moving experience. From 16/03 to 22/09/2019, daily. From 23/09/2019 to 15/03/2020, daily. From September 23rd to March 15th = Winter refuge. Train to Grenoble or Briancon, then by bus to Villar d'Arene. Bus information line: www.info-ler.fr, Tel: 0821202203 The refuge is accessible only to mountaineers by its length (1800 m elevation, 5:30 to 6 hours walking up ) and difficulties (glacial and rocky passages) such access constitutes in itself an F. mountain running difficulty .